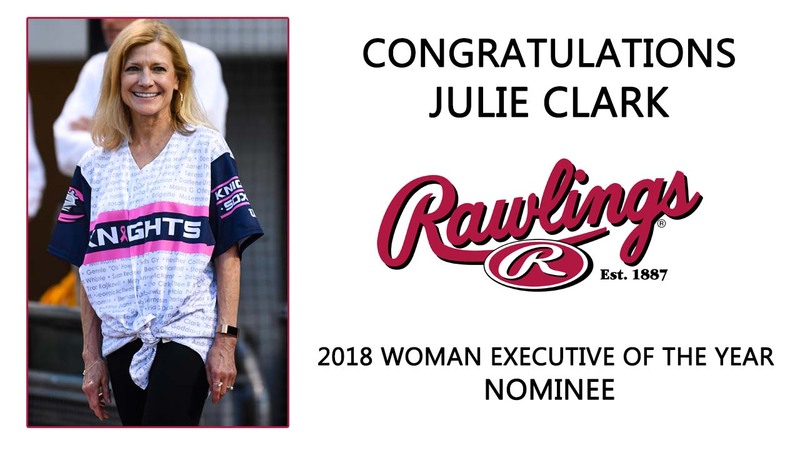 (UPTOWN CHARLOTTE, NC) -- The Charlotte Knights are thrilled to announce that Julie Clark, the team's Director of Special Projects, has been nominated by the International League for the 2018 Rawlings Woman Executive of the Year Award. The annual Rawlings Award honors an outstanding woman executive from either Major League or Minor League Baseball. Clark, who oversees a long list of activites at BB&T Ballpark, recently finished her 12th season with the Knights in 2018. "Julie Clark is a jack-of-all-trades, problem solver and general go to lady in the Knights front office," stated International League President Randy Mobley. He added, " Julie is a stabilizing and encouraging force in the Knights' front office during the course of the long and arduous baseball season."